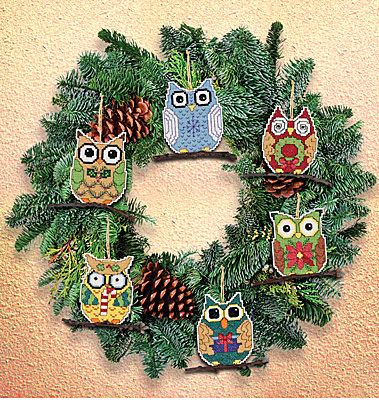 "Owl Ornaments" Another creative and on-trend design from Sandy Garbrandt. Use these fun owl designs to add character to your tree or use as a gift topper for the holidays. Just like the cute owls and the nature theme? These fun designs can be used to accent any space year round, even a car rear view mirror! For a really full and whimsical tree, use these ornaments with some of our other great ornament designs. Each kit includes: 14-count white cotton Aida, white felt for backing, 100% cotton carded 6-strand floss, needle, graph and multi-lingual instructions. Made in the USA by Janlynn. Finished size: approximately 3" x 3" ea. Makes six ornaments.